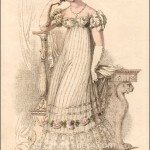 The watered silk of this dress is quite beautifully rendered in the print. 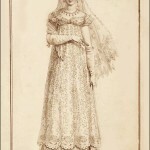 This print, and the French original, shown below, represent one of the earliest mentions of orange blossoms in connection with wedding dresses. The mention of ears of corn in her hair does not refer to American corn or maize. In Britain, the terms referred to various cereal crops, such a wheat or barley. 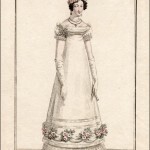 As this type of grain sprig is seen in other prints of bridal dresses, it must have been a custom, perhaps as a symbol of fertility or fruitfulness. 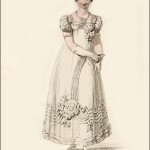 It is also interesting that the description says this bridal dress was used for post-wedding visits. Was it also the dress worn at the actual wedding ceremony? That is unclear, but the suggestion is that it may have been. 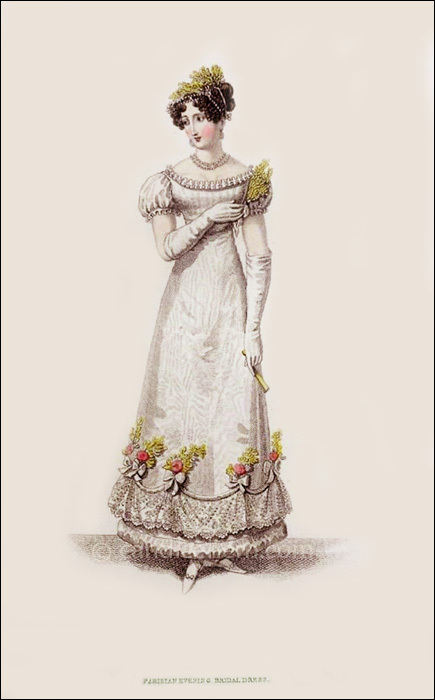 “Round dress of white watered gros-de-Naples, flounced in a festoon of very broad lace of a rich pattern, surmounted by full blown blush roses and orange-flower blossoms. The hair arranged in full curls, and bound round with pearls and ears of ripe corn. Bouquet of orange flowers on the left side of the bust. 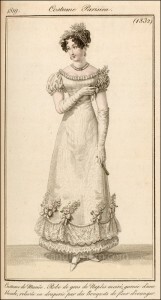 Necklace or pearls, fastened before with a cameo à-la-Antique. Eear-rings à-l’Etoile. Short sleeves, white kid gloves, white satin shoes, and carved cedar fan.